The Stampede Radial LX is a versatile choice for owners of light trucks, sport utility vehicles and multi-purpose vehicles who want the best of both worlds - to ride anywhere, on or off road, and get a great ride and peak performance. The Stampede Radial LX is an affordably priced alternative to big name brand tires, while still providing the kind of quality consumers expect from top brands. The Stampede Radial LX gives hard-driving traction in any driving conditions, including mud and snow so consumers can drive anywhere with confidence. 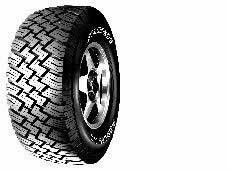 One of the most versatile tire options, while the Stampede Radial LX provides great off road traction, you also get the benefit of long mileage and a smooth, quiet ride. Choose from fourteen sizes for the ultimate versatility.